MADISON – The shade of a single tree can provide welcome relief from the hot summer sun. But when that single tree is part of a small forest, it creates a profound cooling effect. According to a study published today in the Proceedings of the National Academy of Sciences, trees play a big role in keeping our towns and cities cool. With climate change making extreme heat events more common each summer, city planners are working on how to prepare. Heat waves drive up energy demands and costs and can have big human health impacts. One potentially powerful tool, the study’s authors say, are organisms that have been around long before human civilizations could appreciate their leafy benefits. And those trees may be the secret to keeping the places we live livable. Essentially, says Turner, impervious surfaces – like roads, sidewalks and buildings – absorb heat from the sun during the day and slowly release that heat at night. Trees, on the other hand, not only shade those surfaces from the sun’s rays, they also transpire, or release water into the air through their leaves, a process that cools things down. It turns out, she says, that the “heat island” effect is more like what some scientists have called a “heat archipelago” – with smaller islands of heat in a city interspersed with cooler areas of shade. But deploying enough air temperature sensors across town to get the fine-scale resolution they wanted was far too expensive. Research ongoing at the University of Wisconsin-Madison had temperature sensors strapped to 150 utility poles across the city and its surrounding countryside, but those sensors were often one mile or more apart – much too far to provide real-time data on temperatures in backyards and individual boulevards. 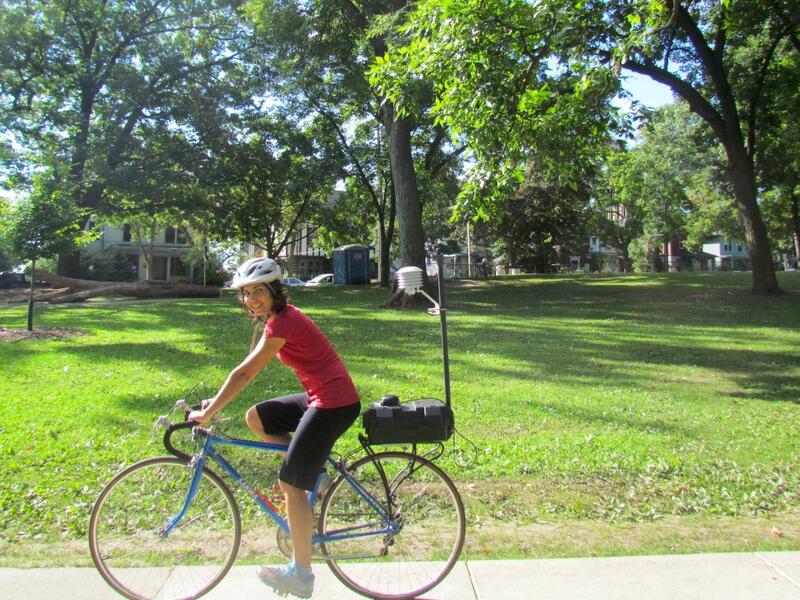 In the summer of 2016, it wasn’t uncommon to see Ziter biking around the city of Madison with a small weather station strapped to the back of her bike. In all, she biked ten different transects of the city multiple times during different times of day. The sensor on her bike marked her location and took an air temperature reading every single second as she rode, resulting in real-time data every five meters. To get the biggest “bang for their buck,” Ziter says city planners should focus on bumping areas that are near the forty percent threshold over that mark by planting trees. But, she warns, it should be in places where people are active and live and not just in parks. Additionally, she says, “we don’t want to abandon the lowest canopy areas of our city either,” as those tend to be neighborhoods with lower income and marginalized communities. “We want to avoid advocating for policies that are simply ‘rich get richer,'” she says. Her results, Ziter says, point to the importance of urban landscaping and development in making neighborhoods more livable in the future. It is also a call for stakeholders to work together when it comes to their trees. It’s not uncommon for “different people to be in charge of different spaces,” she says. For example, the city may be in charge of planting trees along its streets, while the parks department oversees plantings in the parks and homeowners make decisions about their own private lots.